Two miles north of the Confluence Vineyard in the heart of the Anderson Valley, our Gowan Creek Vineyard sees appreciably more coastal fog. The unique terroir of this site brings together elements from both the valley’s warmer regions and its cooler, northern “deep end”. Offering an ideal Southwestern exposure and an array of unique vineyard blocks, Gowan Creek is planted to eight different clones of Pinot Noir, each carefully tailored to a specific site and soil type. The powerful and expressive wine produced from these vines displays beautiful inky depth and robust, untamed fruit flavors. Gowan Creek is the home to our winery and offers a perfect mid-valley winegrowing location that combines warmer Anderson Valley elements with coastal fog and cooling influences from the northern end of the valley. 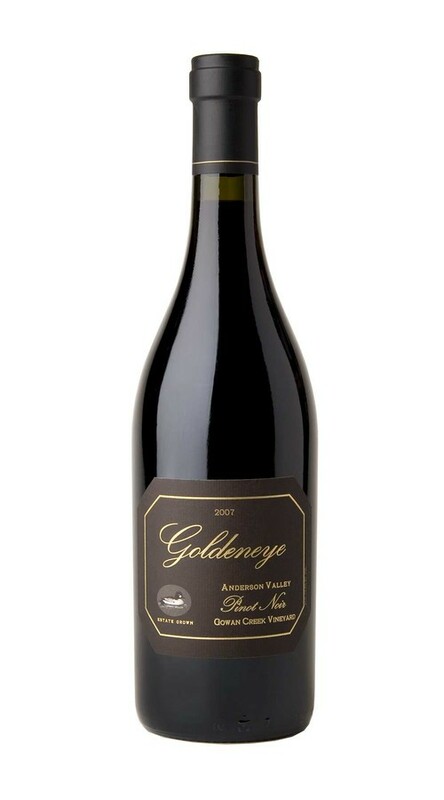 As a result, this wine displays lush extraction and a rich palate with voluptuous red and black fruit layers of raspberry, mulberry, blueberry and huckleberry. This juicy core of berry fruit is supported by excellent tannins and undercurrents of mushroom, herbs, charcuterie, violets and oak. In 2007, a dry winter led to even growth and manageable canopies. The summer was cool, and lacked any major heat spells until just before Labor Day when we began the first of four “mini-harvests.” These mini-harvests allowed us to pick at ideal ripeness over a seven-week period. Although the crop was lighter than expected, the quality was excellent. While each mini-harvest offered fruit with its own personality, there is a lovely consistency to the dark, well-extracted and structured nature of the wines.